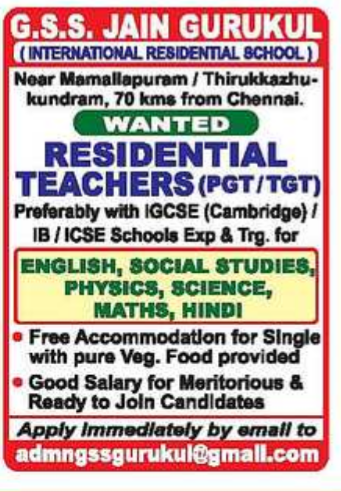 G.S.S Jain Gurukul, Chennai has advertised in THE HINDU newspaper for recruitment of Teaching staff jobs vacancies. Interested and eligible job aspirants are requested to apply immediately. Check out further more details below. About School: With this goal in view, and as per the wishes of the chief donors, this school named after the Yogiraj Guruji Shree Shantivijai Maharaj was founded in the year 1966 to impart education to pupils combining ethical and moral values based on our ancient culture. Sri Mahaveer Jain Kalyan Sangh came into being in the year 1967 as a registered society to promulgate these ideals. This school is now functioning in its own building at Vepery High Road. It stands today as a beacon light for the institutions affiliated to the Central Board of Secondary Education. In Academics, the school maintains a high quality and gets very good results in the examinations at all levels. Our students carved out a niche in all spheres of activities. Preferably with IGCSE(Cambridge/IB/ICSE schools Exp & Trg. Food and accommodation available in school permisses. 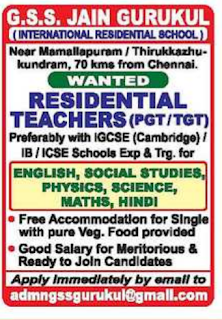 Reference: Recruitment Notification / Career Job Opportunities notice for Teaching Faculty -PGT TGT Jobs on Hindu newspaper Dated 1st July 2018.